Call Toll Free: 1-877-369-8305 / Mobile users, click to call. The SOQI Pad can rapidly generate high temperatures thanks to the latest high-tech heatingceramics. The highest temperature can reach up to 131°F. The SOQI Pad can be used on the shoulders, waist, back buttocks, abdomen and legs. The soothing heat will provide warmth to the body. Innovative technology which achieves and maintains consistent temperature for maximum results. Ideally designed to work on most areas of the body. 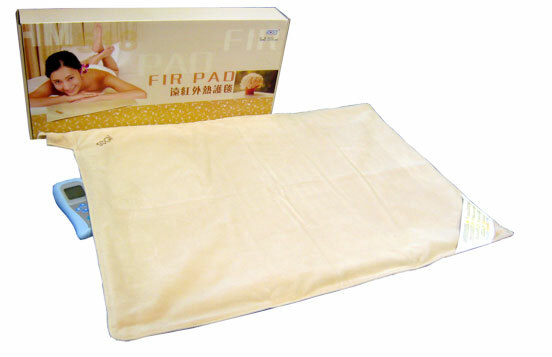 The FIR Pad is Easy and Convenient! HTE has thought of every detail to make the SOQI Pad a product that can be used with confidence by people of all ages. - Easy to unlock - just press any key for 1 second. - Selection from 1 – 60 minutes of heat - just press the (T+) and (T-) keys. - Temperatures in °C and °F are displayed on the screen simultaneously. - Choose from (20-55°C or 68-131°F) with the (up °C) and (down °C) keys. - Taking care of your SOQI Pad is easy - thanks to the removable cover! Free footrest cover, Downloadable Digital Testimonial Book. 2 year warranty, 14 day money back guarantee. Click Here to see ALL the other specials in USA. We sell only the Original Sun Ancon Chi Machine that includes a 14 day unconditional money back guarantee. Shipping Costs for Hawaii & Alaska: $75 for Chi Machine. Please note shipping costs to Hawaii and Alsaka are higher. Please call for a quote. State Tax will be added to all orders where a state retail tax is charged. ©2002-2018 Chi-Machine.com All Rights Reserved. Disclaimer: Chi-Machine.com does not claim that its products will cure or heal cancer or any other ailment. You should seek independent health care advice regarding your personal condition, or seek advice from your medical specialist, general practitioner, chiropractor, naturopath, massage therapist, or other healthcare provider.Chi-Machine.com will not be responsible for the effects of the use of its products, which may prove to be adversary to your health. Chi-Machine.com provides individual experiences only and is subject to your agreement to obtain independent healthcare advice. We are a distributor of HTE Products. Our distributor number is A176505. If you would like to have exceptional customer service and a knowledgeable staff assist you in this purchase please ask us, and we will be happy to serve you. We serve clients all over the United States and the world. We are dedicated to serving you. Our goal is 100% customer satisfaction!